Hello! For those of you who read my blog regularly, you may have noticed that I didn't post on Monday. I've been trying to keep up with my normal schedule, but unfortunately I've been having a bit of a busy month. Either way, I'm back today with a quick swatch of Nine Zero Lacquer crelly 'Peahat' from the Fall 2017 Enemies of Hyrule Collection. Read on for my swatch! 'Peahat' is a light yellow crelly base with a mixture of orange, red, gold, navy, and burgundy glitters. The formula is smooth and easy to apply, and the base is nicely opaque, especially considering the softer colour. I have seen people get this fully opaque in two coats, although I had a few streaks so added a third. Below is three coats with topcoat. What do you think? I love both yellows and crellies, so this is a winner for me! It has been on my wishlist since it first came out, so I'm glad I finally caved in and bought a bottle. This would be perfect for the spring - but to be honest I'd happily wear it all year round. 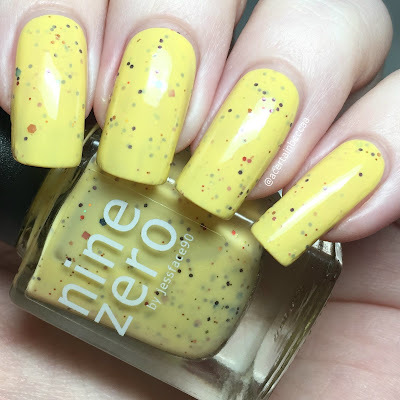 You can find 'Peahat' on the Nine Zero Lacquer website here. I purchased mine on Rainbow Connection here, although the low stock warning is showing so be quick!